In 2010, Nat Strand — an anesthesiologist and person with Type 1 diabetes — competed in CBS’s The Amazing Race, a grueling reality television show that tests both physical endurance as well as mental resilience. It’s not for the the faint-hearted or the weak-stomached — Nat and her best friend Kat Chang completed a wide range of challenges while traveling across four continents, 10 countries, 31 cities, totaling 32,000 miles in a mere 23 days. Her teammate and she, along with her extra stash of insulin, survived the heat of Ghana and the cold of the Arctic Circle. Crossing surging rivers, she removed and secured her life-saving insulin pump. Surviving bungee drops and eating sheep heads, she monitored her blood sugar levels and adjusted insulin accordingly. This fierce duo stopped at nothing to get to the finish line and they won it all — a whopping one million dollars! In the 17th season, they were the first all-female team to win and Nat the first person with diabetes. The first of many for the books and certainly a first time for this type of competition for Nat Strand. Apart from opening hospitals, practicing chronic pain management and raising a family, Nat is a council member at Beyond Type 1 where she continues to inspire Type 1s all over the country. Here’s what she had to say about the incredible feat. BT1: Routine is important for a Type 1, especially when trying to regulate blood sugar levels. So, what did you do in your diabetes management to compensate for varying schedules? NS: I had to let go of any expectation of having perfect blood sugars. Sometimes I had good control of diabetes, and other times I just tried not to let diabetes get in my way. I let my levels run a little high during the race to avoid any dangerous low blood sugars. We never knew when we were going to eat. We were fed at the beginning of each leg of the race, but it could be 12-15 hours without food, so I packed a lot of glucose sources. At breakfast if there was an extra roll, for example, I’d swipe it. Same with snacks on the plane. You never stop for a meal, you don’t have money and you have time constraints. By the end, I’d lost 12 pounds. BT1: For those who might not know, how does varying schedules of eating and sleeping affect your blood glucose levels? Like, why are time-zone changes such a big deal? NS: With time zone changes, you might be active when you are normally resting (and visa versa). This throws things off because my biological time and actual local time are off. My blood sugars tend to run higher in the early morning hours. Thus, my basal rates are higher at that time then they are during the rest of the day. I had to change my pump settings. I calculated my 24-hour insulin needs, and then divided that into equal hourly basal rates. Also, when you are very sleep deprived, your body releases stress hormones, and these can raise your blood glucose levels. So, the combination of time zone changes with lack of sleep make my blood sugar levels erratic and difficult to plan for in advance. BT1: What is the most difficult thing you had to eat during the race? NS: We had two eating challenges. First one, you had to eat a boiled sheep head, (apparently it’s a Norwegian delicacy), which lead us to lead that leg. At least that’s low in carbs. What if I had to eat a giant bowl of pasta? In Hong Kong, they had a giant table of sushi, and you had to eat the real pieces of sushi until you found the fake one. People were getting sick. It probably took me 10-15 minutes to get through the challenge. I was lucky. I decided to focus on sashimi only to avoid all of the extra carbohydrates. I found a fake piece right away! BT1: Staff wouldn’t hold extra insulin — no exceptions made. You had to chill insulin in Ghana and keep it warm in the Arctic Circle, all on your own. Did this surprise you that no special treatment was given for having a medical condition like Type 1 diabetes? NS: It didn’t surprise me, because they don’t interfere; they don’t give anyone a leg up. You’re welcome to come on the race, but you have to manage things yourself. They did not carry extra glucose or snacks or insulin. They have two medics, so if something happened, they could have treated me, but they don’t interfere when you’re racing. BT1: What kind of diabetes plan did you make before the show? NS: Nurse and diabetes educator Carolyn Robertson was amazing with my planning. She gave me so many tips and tricks. She helped me navigate time zones and even pack, suggesting I put pump supplies in ziplock bags instead of boxes to save room. She suggested I combine bottles of test strips to save space. She also suggested that I carry glucose sources that also replenished electrolytes to battle not only low blood sugars, but also dehydration. BT1: Your greatest fear is heights and you had to bungee jump off a loading crane in L.A. at 150 feet for the final challenge. You’ve also mentioned that your BGLs are sensitive to stress. How did you compensate for this or de-stress in the face of this challenge? NS: For the final leg of the race, we had to walk a plank off of a crane, and bungee to a raft floating below. It was terrifying! I have an extreme fear of heights. For me, to destress, the best thing to do is deep breathing and visualization. I kept closing my eyes, telling myself I was somewhere peaceful, and taking slow deep breaths. This helped a little, but I was still completely terrified! BT1: When you were in Hong Kong, your blood sugar dropped extremely low. What did you do to pull yourself out of this? NS: What you can you do? All you can do is treat it and wait until it’s over. I was trying to not let the camera crew see, because you know when you’re low and grumpy, you really don’t want anyone in your face with a camera. I shined my flashlight into the lens so they couldn’t use the shot. As soon as we checked in, someone brought me a sandwich. I hadn’t eaten in 12 hours. BT1: In an interview with Diabetes Life, you said that ‘diabetes is its own animal’, how do you “tame the beast” or have a positive relationship with the chronic condition? NS: I wish I could “tame the beast”. If I could compare diabetes to any animal, it’d be a pet tiger — it’ll never be completely tamed. Plan ahead, make sure you have enough glucose snacks and back up insulin, so if or when something goes wrong, it is an annoyance not a disaster. That’s what I have learned over time. Diabetes will always present surprises, but I find that the more prepared I am, the less of an impact these surprises have on me. When I was in college, I would always wait until the last infusion set or last insulin bottle to replenish my supplies. This led to a lot of stressful situations, looking for an insulin vial with a few more drops to get me through the night. Now, I am more organized and have a lot of back up supplies. If I accidentally rip my pump off or break a bottle of insulin, it is not a disaster at all. BT1: Did you ever feel like diabetes got in the way during your race? NS: Absolutely. It always gets in the way. I usually say it’s a challenge, but NOT a limitation. For every water challenge we did, I had to take off my pump and secure it — it took time. And when your blood sugars are running really high or extremely low, you get sluggish and have trouble concentrating, so you’re not at your prime performance. In addition, my continuous glucose monitor was always alarming since my blood sugars were variable. This would interrupt the little bits of sleep we did manage to get. However, even though diabetes was in the way at times, it obviously didn’t hold me back too much, because we won! BT1: You said, ‘When you become diabetic, everything is almost bad news’ — you have to worry about all these potential dangers. In The Amazing Race, you had to overcome potential dangers as well. What motivates you and how do you keep focused on tackling these challenges beyond the race? NS: I think life naturally gives you challenges you want to overcome. In The Amazing Race, I was certainly motivated to win and prove someone with Type 1 could complete all of the challenges on The Race. When I decided that I wanted to have kids, I did what I needed to in order to get my blood sugars under control and have a healthy baby. I never want to miss out on anything because I live with diabetes. I think motivation also comes from connecting with people on the other side of the things that I want to accomplish. I see that it’s been done. Whatever I have wanted to do, from scuba diving to my medical residency to studying abroad to having kids, I’ve been motivated by other people with diabetes who had done it before me. 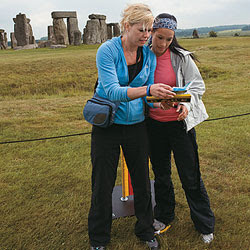 BT1: Being the first all-female team to win The Amazing Race makes you a spokesperson for women as well as for people with diabetes. If you could tell your child-self something, what would it be? NS: Wow, there are so many things I would tell my child-self … I would tell my child-self to be patient and everything will work out. If it doesn’t seem right in the moment, just wait and the right thing will come along. I think when you’re young, you’re also impatient. I’d say, “Don’t worry; just enjoy life.” In particular in terms of diabetes, I worried about all of the potential complications of diabetes. You hear all of these terrible statistics, and I used to cry thinking I would be blind or have a missing limb. Here I am 26 years later, without any complications. It’s important for newly diagnosed individuals to know that – that we can live long, happy, healthy and complication-free lives with Ttype 1 diabetes. I would have liked to know that when I was a child. BT1: What was it like coming home afterward? Was it difficult to “slow the adrenaline”? Did you miss anything? Did you feel like you’d changed? NS: I did miss the adrenaline! There is something so amazing about competing everyday. It must be what professional athletes feel like. You wake up with laser focus and you have a team; all that matters is to make it to the finish line. For awhile, every time I saw a yellow taxi sign, I’d think it was a clue. Taxis are just taxis now and I can get them whenever I want. [She laughs] I did miss being on the race when I came back though — it was so wonderful. NS: Yeah! Life is so different. Back at that time, five years ago, I was traveling, living in California, scuba diving, doing races etc. Now, I’m a mother of a nine-month-old; I’m married and have a home. My challenges are just as exciting, but within four walls.